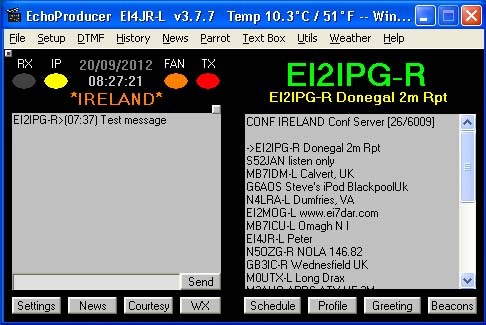 EchoProducer is a simple to use Windows XP utility that uses the Text to Speech engine that comes with Windows. Ideal for Sysop/Owner of a Repeater / Link or Conference Controllers. There are many tools in this program that will assist you.. Courtesy tones using CW or Audio file ID's with effects (Door bell sounds). Weather conditions Current, Forecasts and Warnings. Auto connect options. Text Box Greetings for connecting stations. 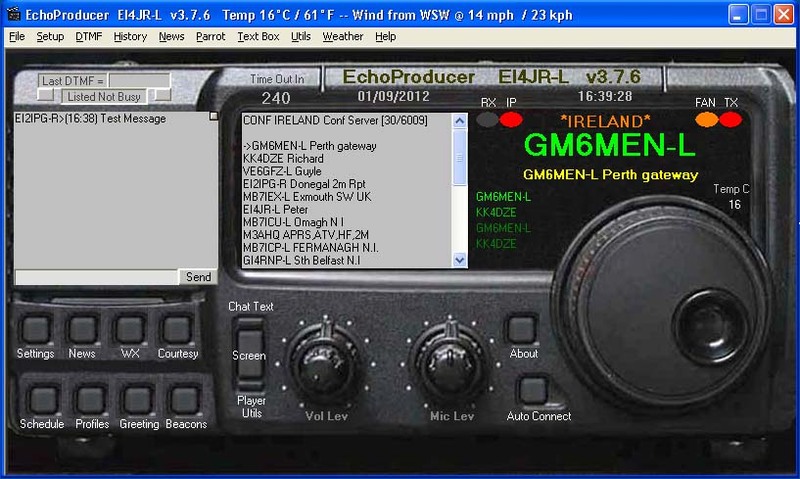 DTMF audio player can be used for Help or Information audio files. Graphical Text Chat box. Up to 20 random Beacons using TTS. News Player, Download and play the news to your RF users all automatically. Sysop / Admin Conference Controller option. DTMF single or group connect / disconnect. Times Connect and disconnect station in the conference Timed silence mode option. Plus much more. This program runs along side the EchoLink program. 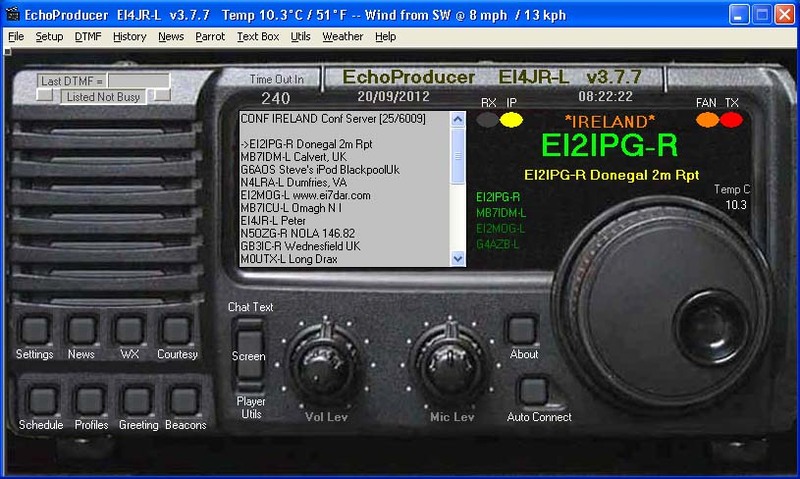 A BIG Thank You to Jonathan K1RFD for providing EchoLink. Without it this program EchoProducer would not have been possible. 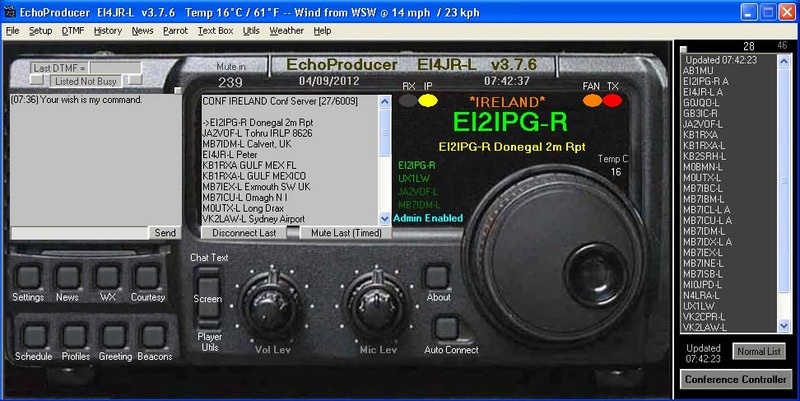 The EchoLink program is provided FREE as is the EchoProducer add-on. The small button at the top left of the windows will make the text larger / smaller whish will make the text a little easier for the poor sited. The button to the right of the station list will reveal a larger station floating list. The buttons either side of the Listed not Busy window will enable and disable the "Listed Busy" and "Listening Only"
These are the main screen and will give you the option to go to various parts of the program. Normal users and Conference Admin will see slightly different screen as shown in the top picture. Conference Admin will see some extra buttons and functions as shown in the above screen to control there nodes and conferences. The time out counter is Only an indicator for you and does nothing else. The amount of minutes to be changed to meet your needs. All important information is displayed on the easy to see screen with the option to display and alter some of the parameters using the setup button. The small button at the top left of the window will make the text larger / smaller whish will make the text a little easier for the poor sited. The buttons either side of the Listed not Busy window will enable and disable the "Listed Busy" and "Listening Only"
C:\Program Files\EchoProducer\ is where the program places its files. You must let the program install it in the default directory. Updates to the program can be checked and checked from the program and updated. See below for update information. EchoProduce runs under the Windows XP platform. Due to the size that the program has grown I would suggest that the computer speed needed would be over1 gig speed and as much memory as you can. 500 meg and above. The rule of thumb her is the fastest computer with the most memory as possible. Where can I get voices from? I used NeoSpeech voices from http://www.nextup.com. I found Kate16 to be the best. Check in your Control Panel for the speech Icon and that your Text to Speech is working first before running EchoProducer. I have not tried it on any of the other windows. If you have and it works let me know. Check out the Microsoft web site Microsoft Speech SDK 5.1 for more information. The program uses the XP speech engine and this must be working before the EchoProducer program is run. You can test the voice here and when you are happy with your selection click OK. Your voice should work with any of your programs that use the speech engine like EchoProducer. TOOLS - SYSOP SETTINGS - IDENT and blank out the callsigns and all remaining tick boxes must be empty. Tick the Use external file box. Make sure your Windows clock is on 24 hour time. To do this, go to the Windows control panel, make sure it is in "Classic View" and choose "Region and Language Options." Then, click Customize. Choose the tab labelled "Time." Under the Time Format pull-down menu, choose "HH:mm:ss." Click OK, Then OK again, and Windows should now be showing the time in 24 hour format. Every body has there own idea on the colours that they want there EchoProducer to be so the option to change the colour of the main screen only to your preference also the LED indicators can be changed. This can be accessible from the setup menu or the small buttons wither side of the station talking area. Your computer alert setting MUST be turned OFF when using EchoLink as the noise made can be transmitted through the system especially when using VOX. Some conferences will Mute you if these Computer noises are heard. This will happen on the *IRELAND* conference so be warned. Also be mindful of your transmitter when transmitting large files you could damage your radio if you are running high power and don’t have sufficient cooling. You are responsible for your equipment so check with the equipment manufacturer if you are unsure. or send it via PayPal to " ei4jr@eircom.net "